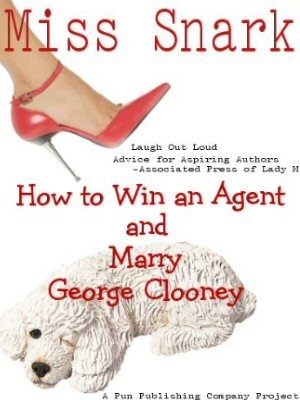 Miss Snark, the literary agent: pssst...wanna buy a blurb? I'm a multi-published author who has been asked repeatedly to read and offer an endorsement of unsold, unpublished manuscripts. I've been told by several writers that their agents have asked them to secure author quotes to entice editors. I feel very uncomfortable reading uncontracted work, but aside from that I don't understand this seemingly new strategy. What do you think of obtaining author quotes prior to sale? Is this a new trend? Does it really help? Well, if it's a new trend it's escaped my notice. I've never had an editor ask for a pre-submission blurb and I've never solicited one. Sometimes I have them but I use them only as "we've got good pr blurbs already from Moe, Shoe and Park". I am a rabid dog about my clients reading unpublished, uncontracted work. I strongly STRONGLY discourage them from reading anything unless it comes from an agent or has been sold. I tell them to say "my agent strongly objects to me doing this--and I'm afraid of her so I don't do it." It only takes one or two nutcases to decide you've stolen their idea, character, life, or improperly used their trademarked word "and" to start litigation. You can't avoid all the nutcases but you can reduce your exposure by NOT taking work that isn't represented or sold. There are certain publishers--and I'm talking reputable, NY publishers--who do indeed ask for pre-publication blurbs. Perhaps it's more usual in certain genres than others. It happened to me, when my editor was pitching my novel to her superiors. She asked my agent if there were any published authors who would be willing to endorse my book, to help her make her case to her boss. This is when all your networking skills come into play. All those years of making contacts. All those hours of chatting online. This is why it's all good and really not a waste of your time because NOW the hour has come and you can call in all the favors owed you and impress an editor and his/her cohorts of higher achievement. But seriously, what are they thinking? Is it so bad in that committee meeting that you have to have major backing to convince them that your novel has worth? I'm going to have to excuse myself from the room because I may have to barf. Fact is, if you had an agent or at least a decent agent, they wouldn't ask for this. I'm sorry, but my jaded self has kicked in and I must go put it down because if I don't it's going to explode all over Miss Snark's blog and she will probably hit me on the head with her gin pail if I mess up her blog. It's reassuring to know that the need to ask questions of Miss Snark never ends, even when you're a famous NYT best-selling author! And now I have a taste for some moo siu pork. P.S. Love the word verification--took it for my i.d. Oh yeah, that reminds of what Scott Turow said once about being a lawyer. "You can't really save the world but you DO have the power to make everyone else's life miserable." Maybe the pre-sale endorsements are their way of asking "Do you know anyone who'll lean on me if I reject your manuscript?" Yet another tidbit that's good to know. And it's also a great way to keep at bay the throngs of people pushing manuscripts in your face. "Sorry, I can't, my contract forbids it." I have been asked about possible endorsements when the acquisition gods are on the fence about a particular project. I understand Miss Snark's reticence to ask her authors to consider blurbing books pre-sale, but the fact is that sometimes the availability of endorsements is what clinches the sale. It's a sad reflection on the state of publishing, but decisions these days are often made on the marketability of a book, not necessarily its literary merit. Clearly, authors have the right to say no, but I would hope that they might remember being a new, unpublished author as well. I was lucky enough that a NYTBS author read my stuff at a conference and offered a blurb. I do think it helped sell the book, but I never would have asked. I do however now vow to buy all her books in hardcover and generally grovel when she is around. Ms Snark, your snide comments about someone trademarking the word, "and" aside. I have told you repeatedly that my client has trademarked the word Gin. Please stop using it without permsision. I received pre-pub blurbs for one of my upcoming books (and thanked the authors who graciously read it and loved it), but it wasn't for my agent's use. It was for my publisher, and the book was already sold. There's a big difference, IMO, when the book is contracted, written, and ready to go to print. I would definitely consider giving a pre-pub blurb to a contracted author if I really liked the book, but I would not read an unsold manuscript or even consider an SP manuscript of any sort. Too many potential tangles there. My agent doesn't encourage it, either. you can reduce your exposure by NOT taking work that isn't represented or sold. Best selling author's question is "are blurbs ok in steps 1-5, to which MS says no, never. My agent was having trouble selling a book of mine--and early on, when I could see this trouble rearing its head, I asked if he wanted pre-pub blurbs. (A lot of my friends have books out and have been real supporters, so blurbs would not have been a problem.) To my surprise, he said no. I got the impression that he preferred to let the work stand on its merits, without giftwrap. Regarding the timeline above, this would have been between steps 5 and 6. Critique groups-ok to keep sharing ideas? Querying Miss Snark... why wouldn't you? ?